The override happened, with all of The Five Democrats sticking with the Republicans. We'll see how that works out for them in the days ahead. 'Course, we'll also see how this 19th-century budget works for the 21st Century. Picture here was taken in the House gallery about 20 mins. before the vote. 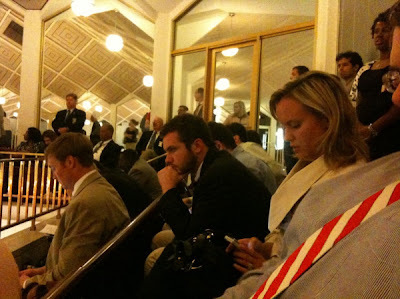 A vigil over the death of progressive government in North Carolina. Mr. Tillis: We now know clearly who gives a damn about education and our children's future. Shame on you and your midnight travesty. Clean air and water on the chopping block next. I read that part of this budget includes defunding of Planned Parenthood. I attend a Southern Baptist church and regularly tithe. I feel so sickened by what is taking place in NC. My family has decided to stop tithing to our church for atleast the next 3 months and give our money to the Community Care Clinic and other local causes. I feel ashamed that I would give $200 a month to our church when so many others in our community and state will now be in desperate need. I will still be tithing in a sense, but it won't be to the church, it will be directly to the poor and needy. Back to the "good old days" of backroom abortions, dirt roads and a permanent underclass with no access to education, healthcare or opportunity. Disgusting. Simply, disgusting. I hope the Dems that sold us out pay with their seats in 2012 -- but the public has a short, short memory. Way to go, goobers! At least somebody wearing the "D" label still knows right from wrong.